This post is a continuation in a series of posts looking at late nineteenth century photographers. By using the information on the rear imprint, our aim is to use this information as a guide to helping us narrow down a date range of when the photograph was taken. 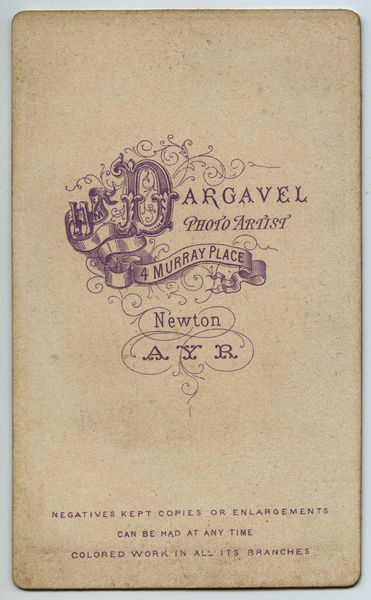 On the back of one of the carte de visite photographs in the Georgina Auld nee Muir album is a photograph by Scottish 'photo artist' William Dargavel. Dargavel's studio is listed as 4 Murray Place in Newton, Ayr. Unfortunately there does not appear to be very many examples (on the internet at least) of the rear imprint from a William Dargavel photograph to use as a reference...to the extent that I haven't been able to find any! Another problem associated with trying to track down William Dargavel is access to online Scottish newspapers covering Ayr. For the purposes of this post I will be using Scottish Post Office Directories which have been made available via the Digital Collections from the National Library of Scotland. Searching through the Post Office Directories of Ayrshire, the first mention of William Dargavel appears in the 1870-71 Post Office Directory for Ayr Newton and Wallacetown. In this directory William is listed on page 38 at the house address of Gordon Place in Wallacetown. He is also listed as being of W. & J. Dargavel. Wm. & John Dargavel are listed as tobacconists at 6 High Street, with John Dargavel also listed as living at Allison Place in Allison Street Newton. William Dargavel is also listed on page 71 of the directory as a tobacconists at Gordon Place and at the shop on 6 High Street, Ayr. The 1873-74 Post Office General and Trades Directory for Ayr, Newton, and Wallacetown lists William Dargavel on page 34 as living at 1 Albert Place, New Bridge Street. John Dargavel and the business John & Wm. Dargavel [sic] are listed at the same addresses. There is no mention of a William Dargavel listed under Photographic Artists in the Trade Directory section of the Directory (page 111). J. & W. Dargavel are listed under Tobacconists on page 115. Proceeding to the next available directory, the 1876-77 Post Office General and Trades Directory for Ayr, Newton, and Wallacetown, Willliam Dargavel is listed at the house address of 4 Murray Place, Newtonhead. 1876-77 Post Office General and Trades Directory for Ayr Newton and Wallacetown, p.35. As can be seen in the extract above, William is still listed as a tobacconist in the partnership of John & Wm. Dargavel at 6 High Street. The partnership of J. & W. Dargavel is also listed in the Trade Directory section of the 1876-77 Directory under the subheading of Tobacconists (page 109). It is in the Trade Directory section that William Dargavel is also listed under the Photographic Artists, thus confirming Dargavel as operating his photographic business from the same address as his home. Six other Ayrshire photographers are also listed in this years directory. 1876-77 Post Office General and Trades Directory for Ayr Newton and Wallacetown, p.105. There is no mention of either William or John Dargavel listed in the 1878-79 Post Office General and Trades Directory for Ayr, Newton, and Wallacetown. The documentary evidence based solely on the information sourced from the Post Office Directories, dates the photo to 1876 ±2 years. Further research may be able to narrow the date range down further.